Advanced Level and Ordinary National Certificate examinations. Opinions differ in many cases as to what is required in answer to a given question, and the authors would not suggest that their answers are perfect. 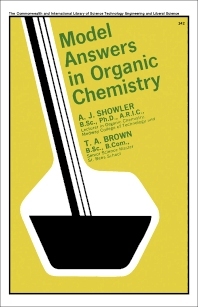 Nor should the student use them as such, or assume that all the organic chemistry he needs is to be found in this book. The answers are intended only to supplement the information in the normal textbook used in preparing for the examination, and to serve as a guide to the reader, in that they show, for example, how long an answer should be, how information should be presented, the type of sketch required, the essential equations and details of a preparation. The book presents questions on the following topics: structure and isomerism, alkyl halides and related compounds, ether and alcohols, alcohols and phenols, aldehydes and ketones, carboxylic acids, esters, nitriles (cyanides), amines, diazonium compounds, and benzene and derivatives.